Lake Powell is a man made resevoir on the Colorado River straddling the border betwen Utah and Arizona. It is the second largest man made reservoir behind Lake Mead and when full at 3,700 feet above sea level, Lake Powell is 186 miles long and has 1,960 miles of shoreline. It was named after Major John Wesley Powell who led a group of nine explorers on a scientific expedition down the Green and Colorado rivers in 1869. Construction of this concrete arch type dam began on October 1st 1956 with a demolition blast keyed by the push of a button by President Dwight D Eisenhower at his desk in the Oval Office.On February 11th 1959 water was diverted through the water diversion tunnels and dam construction could begin. Later that year the bridge was completed which allowed trucks to deliver materials and equipment for the dam and also for the new town of Page, Arizona. Concrete placement started around the clock on June 17th 1960 and the last bucket was poured on September 13th 1963.The dam cost $187,000,000, first power generation was September 4th 1964 and was dedicated on September 22 1966 by Mrs. Lyndon B. Johnson. Upon completion the Colorado River began to back up and the newly flooded Glen Canyon formed Lake Powell, taking 17 years for the lake to rise to the high level mark, its "full pool" on June 22nd 1980. The total capacity when full at elevation 3,700 feet is 26,215,000 acre feet and surface area 266 square miles. Releases of water from the dam were adjusted daily and sometimes hourly to respond to changes in demand which is an operation known as "peaking". 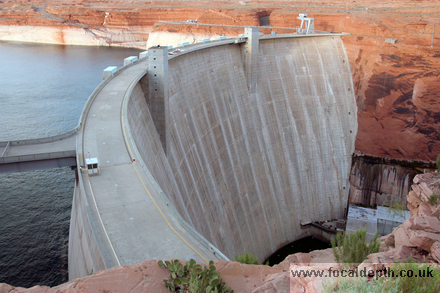 This meant that the water level below the dam could fall or rise 14 feet a day.So the Glen Canyon Environmental Studies Programme was set up in 1982 which ultimately led to a Record of Decision in 1996. This means that besides meeting power needs the dam is being operated in consideration of the environment.